Now that most of the fighters from the rebel group M23 have surrendered, issues of reintegration and amnesty are key to ensuring that the group remains disbanded, said Arthur Boutellis, Research Fellow and Advisor to the Peace Operations in Africa Programs at the International Peace Institute. Boutellis said members of M23 have indicated willingness to be integrated. “Immediately after the M23 announced that it surrendered, it indicated that it would get its fighters ready for a possible disarmament, demobilization, reintegration (DDR) program,” he said. He said what is different here than with other reintegrations is that “you’re reintegrating elements that deserted from the Congolese army,” and that makes it more difficult for the Congolese government and the army. Key questions also remain around amnesty, said Boutellis. “The Congolese government, the UN, and the various special envoys to the Great Lakes region have clearly said that M23 leaders should not get amnesty this time, and that those guilty of war crimes and crimes against humanity should not be allowed to escape legal action,” he said. Earlier this week, the Congolese government rejected a peace deal with the M23 rebels. “Kinshasa basically believes that its military victory over the M23 a few days ago has changed the terms of the negotiations and that the M23 now should not be allowed to sign the peace agreement that it had been negotiating unsuccessfully for the last few months,” Boutellis said, and that a recent split within M23 is adding to the complexity. Marie O’Reilly: The M23 rebel group in the Democratic Republic of Congo surrendered last week following a military defeat by the Congolese armed forces and UN troops. This week, however, they failed to sign a peace deal with the Congolese government, and now the group has announced that it is splitting in two. So, I’m here with Arthur Boutellis, Research Fellow and Advisor to the Peace Operations in Africa Programs here at the International Peace Institute, to discuss what exactly is going on in Congo right now. Arthur, why was the deal not signed, and what is behind the split? Arthur Boutellis: It seems that the deal fell apart at the last moment when the government of the Democratic Republic of Congo and the M23 failed to agree on what this deal would be, whether it would be a peace agreement or, instead, a simple declaration or conclusion, as it was presented. And the reason for that is simple. Kinshasa basically believes that its military victory over the M23 a few days ago has changed the terms of the negotiations and that the M23 now should not be allowed to sign the peace agreement that it had been negotiating unsuccessfully for the last few months. But, beyond the title of this deal itself, I think there are two key issues that need to worked out now between the government of the DRC and the M23. One is the possible integration of some of the M23 fighters back into the Congolese army, FARDC, and under what conditions. And then, the issue of amnesty—that some M23 leaders could get out of such a deal, and how many of them, basically. Both of these issues are particularly key because, if you remember, the failed integration of former CNDP rebels—which is the previous incarnation of M23 rebels—is at the root of the latest rebellion, which started with an army mutiny of some of these integrated elements. On the second part of your question, certainly what we heard [Wednesday] morning, the split within the M23 is clearly adding to the complexity. I think it’s a bit early to tell, but this branch of the M23 that split away clearly indicated that they would be willing to sign a declaration of sorts. It is unclear whether it’s going to happen, but I think here we see the possibility of some element distancing themselves from the M23 military leaders to move forward. MOR: The M23 leader Sultani Makenga and many of his fighters are now in neighboring Uganda, where the negotiations were being held. Is it possible that Uganda could offer amnesty to him and other fleeing fighters, and might this be part of the peace deal? What effect would that have? AB: First of all, the Congolese government, the UN, and the various special envoys to the Great Lakes region have clearly said that M23 leaders should not get amnesty this time, and that those guilty of war crimes and crimes against humanity should not be allowed to escape legal action. Now, it is unclear whether the Ugandan government will hand over those M23 leaders to the Congolese government or not—particularly if they are not given amnesty as part of the forthcoming deal. And the government of Uganda, who was also the mediator in the Kampala negotiations, has actually—a couple days ago when the M23 initially surrendered—posed the signing of a peace deal as a precondition for possibly handing over some of the M23 leaders. MOR: The negotiations between the Congolese government and the M23 had been going on for ten months, but there is also a regional peace process for the Great Lakes that incorporates Uganda, Rwanda, and others. What effect is M23’s surrender likely to have on the regional peace process? AB: I think many would want to see the Kampala negotiations concluded quickly, whether as part of a declaration or an agreement, precisely in order to move forward the elusive regional peace process, which would basically involve refocusing the attention away from the M23 where it had been in the last few months and away from the Kampala process that would then be concluded towards some of the other issues, or of course the other armed groups operating in eastern DRC—particularly the FDLR, as it was mentioned by Rwanda, but also by the government of the DRC and the United Nations, that it was their intention now to focus on other groups, including the FDLR. But, I think, given the history of cyclical crisis and rebellions in eastern DRC, there should be no illusion that the military solution can bring durable stability unless regional peace is really moved forward. The focus should now be on addressing some of the underlying causes of the conflict at the local, national, and regional levels. And these include the rebellions, as I’ve mentioned, but also other issues such as the refugees and governance issues in the DRC. I think the government of the DRC has committed to some reforms as part of the framework agreement that was signed in February 2012. And now I think we will have to see whether the victory over the M23 doesn’t result in the government of the DRC also moving back from its previous commitment to the framework agreement. MOR: Coming back the M23 for a moment, what capacity does the group have to resume fighting in the future? Can disarmament, demobilization, and reintegration be insured by any peace deal? AB: Clearly, the M23 has been weakened considerably in the last round of fighting. That said, I believe it could still regroup, because most of its fighters—it’s been reported—have crossed into Uganda. I think Uganda put forward the figure of 1,700 M23 fighters now in Uganda. 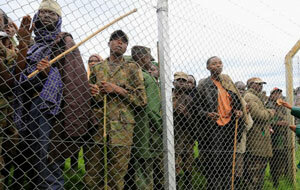 But that, the regrouping of M23, would then imply a high level of complicity from the Ugandan government. I’m not sure the Ugandan government would want to be seen as again possibly supporting the M23, as it had been accused of doing so alongside Rwanda by the UN Group of Experts some months ago, even though both countries have always denied it. In addition, maybe you will recall that there is another group of M23 fighters from a different branch that surrendered after Bosco Ntaganda, and these are in Rwanda as well. So, I think in this context, it’s important that the UN mission—in addition to turning its attention to tackling other armed groups in eastern DRC as instructed by the Security Council—it’s important that it also continues to focus on monitoring the border, including with the UAVs [unmanned aerial vehicles] that should be arriving in the UN mission later this year (in December, I believe), precisely to try to prevent fighters and weapons from crossing the borders and thereby prevent a possible resurgence of the M23. MOR: Those who do not sign the peace deal—if some people don’t—is it going to be much harder to deal with them, to reintegrate them into society after disarming them? AB: Well, there are two things here. There is an issue of whether the larger M23 group recognizes the leaders that will sign on to the deal. Presumably, most of the M23 are fighters, and recognize their military leaders. So, if you have the political branch of the M23 that signs on to your deal, this is no guarantee that the M23 fighters will actually obey by the terms of the deal, particularly if it includes an integration or reintegration component. MOR: Isn’t it in the interests of the fighters to become a part of some sort of DDR program, or not? AB: Again, it depends on the terms of the agreement. Immediately after the M23 announced that it surrendered, it indicated that it would get its fighters ready for a possible disarmament, demobilization, reintegration program. So, I think they’ve clearly indicated their willingness. Now, do they want to integrate [into] the Congolese army, or do they want to benefit from social reintegration? I think that’s one question. And then, if some of them agree to integrate into the Congolese army, then will they agree to the terms of the Congolese state—which would possibly involve basically moving them away from eastern DRC? Why I’m mentioning this is because it has been a contentious issue in past DDR programs, especially when CNDP fighters were integrated into the Congolese army but then the deal collapsed when the Congolese government tried to move those units away from eastern DRC. MOR: Is it possible that the deal will include language that indicates that fighters will be punished for war crimes and crimes against humanity, and maybe that is why some are refusing to sign on? AB: I’m not sure whether the deal would actually include specific language. If there were to be partial amnesty, at least for some of the M23 leaders—not for all of them—it might be included in this agreement. But again, I think a key component will be how many and who among M23 leaders will possibly get amnesty, and what rank would those get if they were to reintegrate into the Congolese army. And I think that’s a key question here, because what’s different this time around if there were to be integration is that you’re reintegrating elements that deserted from the Congolese army. You’re not only integrating militia or ex-fighters. A lot of them—not all of them, but at least the leaders of the M23—were once part of the Congolese army, and then defected. So, I think it makes it more difficult for the Congolese government—and honestly, for the Congolese army also—to accept to reintegrate some of these elements. MOR: Arthur, thank you so much for sharing your insights with us.